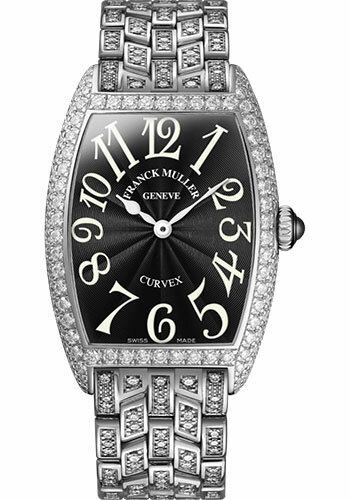 25.00 mm x 35.00 mm 18K white gold case set with diamonds, black dial with white Arabic numerals, 1752 QZ quartz movement, approximately 2 years of power reserve, 18K white gold bracelet half set with diamonds. Water resistant to 3 atm. 25.00 mm x 35.00 mm 18K white gold case set with diamonds, blue dial with white Arabic numerals, 1752 QZ quartz movement, approximately 2 years of power reserve, 18K white gold bracelet half set with diamonds. Water resistant to 3 atm. 25.00 mm x 35.00 mm 18K white gold case set with diamonds, bronze dial with white Arabic numerals, 1752 QZ quartz movement, approximately 2 years of power reserve, 18K white gold bracelet half set with diamonds. Water resistant to 3 atm. 25.00 mm x 35.00 mm 18K white gold case set with diamonds, chocolate dial with chocolate Arabic numerals, 1752 QZ quartz movement, approximately 2 years of power reserve, 18K white gold bracelet half set with diamonds. Water resistant to 3 atm. 25.00 mm x 35.00 mm 18K white gold case set with diamonds, green dial with white Arabic numerals, 1752 QZ quartz movement, approximately 2 years of power reserve, 18K white gold bracelet half set with diamonds. Water resistant to 3 atm. 25.00 mm x 35.00 mm 18K white gold case set with diamonds, grey dial with white Arabic numerals, 1752 QZ quartz movement, approximately 2 years of power reserve, 18K white gold bracelet half set with diamonds. Water resistant to 3 atm. 25.00 mm x 35.00 mm 18K white gold case set with diamonds, pastel blue dial with white Arabic numerals, 1752 QZ quartz movement, approximately 2 years of power reserve, 18K white gold bracelet half set with diamonds. Water resistant to 3 atm. 25.00 mm x 35.00 mm 18K white gold case set with diamonds, pastel green dial with white Arabic numerals, 1752 QZ quartz movement, approximately 2 years of power reserve, 18K white gold bracelet half set with diamonds. Water resistant to 3 atm. 25.00 mm x 35.00 mm 18K white gold case set with diamonds, pink dial with white Arabic numerals, 1752 QZ quartz movement, approximately 2 years of power reserve, 18K white gold bracelet half set with diamonds. Water resistant to 3 atm. 25.00 mm x 35.00 mm 18K white gold case set with diamonds, red dial with white Arabic numerals, 1752 QZ quartz movement, approximately 2 years of power reserve, 18K white gold bracelet half set with diamonds. Water resistant to 3 atm. 25.00 mm x 35.00 mm 18K white gold case set with diamonds, white dial with black Arabic numerals, 1752 QZ quartz movement, approximately 2 years of power reserve, 18K white gold bracelet half set with diamonds. Water resistant to 3 atm.